Though RT Cores are Turing’s poster child feature, the tensor cores were very much Volta’s. In Turing, they’ve been updated, reflecting its positioning as a gaming/consumer feature via inferencing. The main changes for the 2nd generation tensor cores are INT8 and INT4 precision modes for inferencing, enabled by new hardware data paths, and perform dot products to accumulate into an INT32 product. INT8 mode operates at double the FP16 rate, or 2048 integer operations per clock. INT4 mode operates at quadruple the FP16 rate, or 4096 integer ops per clock. Naturally, only some networks tolerate these lower precisions and any necessary quantization, meaning the storage and calculation of compacted format data. INT4 is firmly in the research area, whereas INT8’s practical applicability is much more developed. Regardless, the 2nd generation tensor cores still have FP16 mode, which they now support in a pure FP16 mode without FP32 accumulator. While CUDA 10 is not yet out, the enhanced WMMA operations should shed light on any other differences, such as additional accepted matrix sizes for operands. Inasmuch as deep learning is involved, NVIDIA is pushing what was a purely compute/professional feature into consumer territory, and we will go over the full picture in a later section. 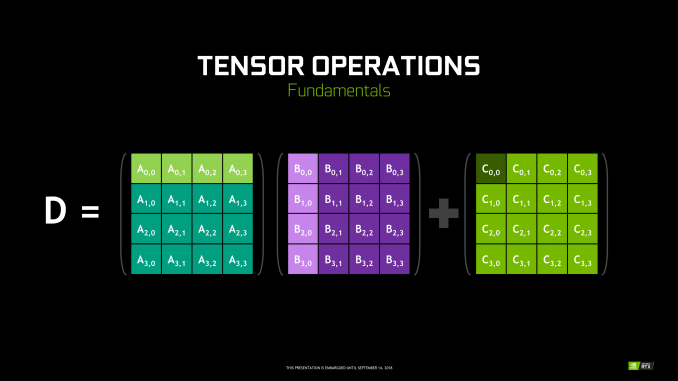 For Turing, the tensor cores can accelerate the features under the NGX umbrella, which includes DLSS. They can also accelerate certain AI-based denoisers that cleanup and correct real time raytraced rendering, though most developers seem to be opting for non-tensor core accelerated denoisers at the moment. Nice write-up! 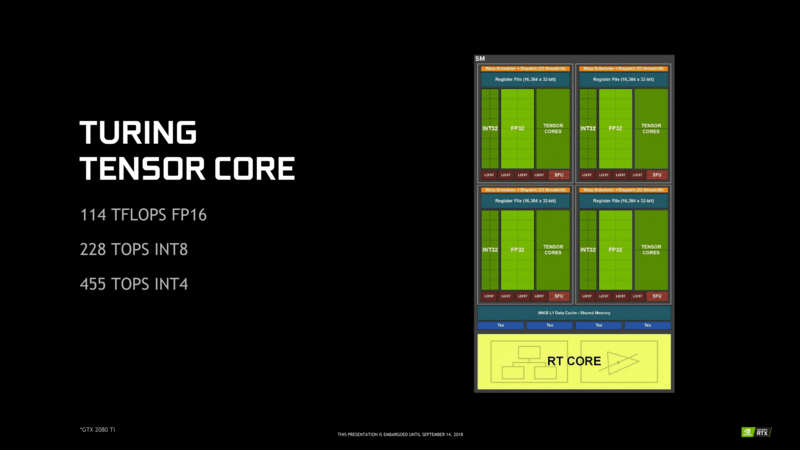 With 25% of the chip area dedicated to Tensor Cores and other 25% to RT Cores NVIDIA is betting big on DLSS and RTX for gaming usecases. With all the architectural improvements, better memory compression ... AMD is out of the game, quite frankly. As far as I can tell, GigaRays/Sec is not an nvidia made term. It's been used before by others too, like imagination tech. I don't know the technical details of ray tracing, but how is that nvidia statement related to scene complexity, etc?